Yeah, it’s been a while since I posted on progress! I’ve been running from project to project and have a million photos to upload and share… always be sure to check out the Instagram page for more current blips on construction site day-to-day stuff…but be warned the account is peppered with other random, ‘colorful’, not work-related photography. I’ll leave it at that. 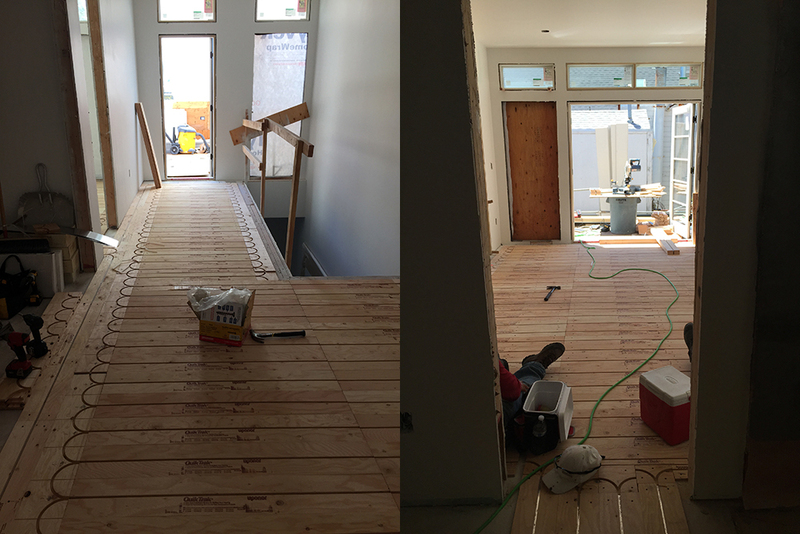 Here we are back at the Pacific Heights House, Part Deux. As of today tile has begun install. 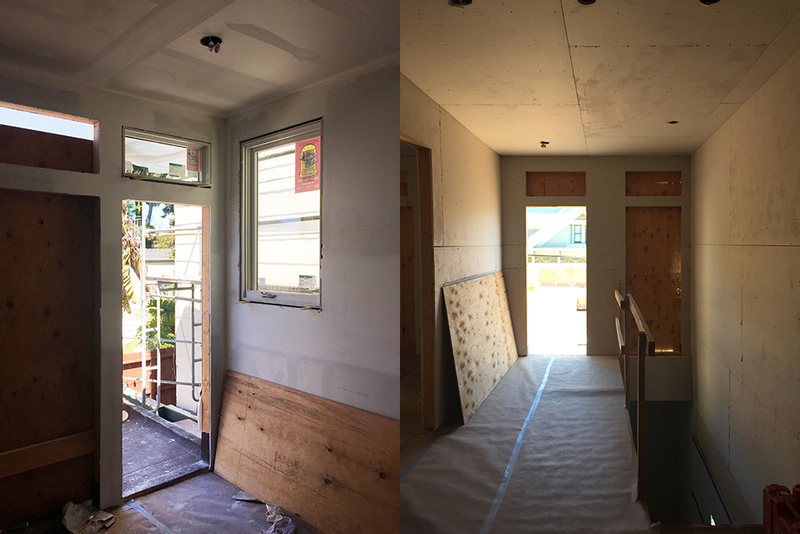 Since May the crew has motored through the last bit of framing, through rough plumbing and electric, gyp board and radiant heat install. 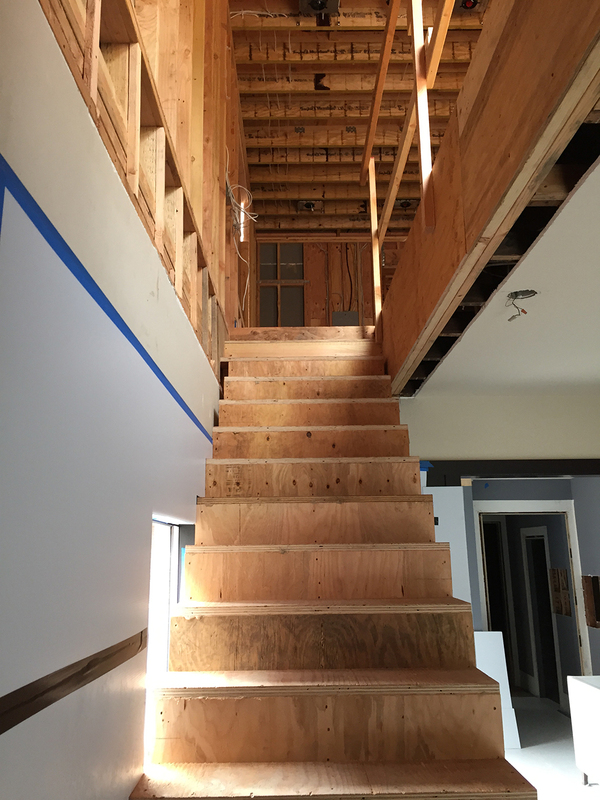 Above is a view up the new stair to the new top floor. Two more views below. 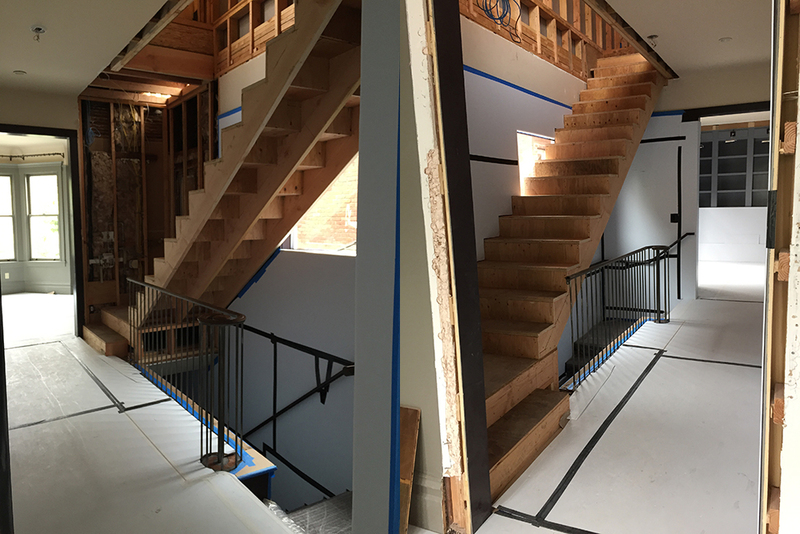 Above are two photos of the front room of the house. We’re adding new shear / plywood to the perimeter walls because of the heavy addition above. In 2009 we didn’t get into these walls much, hence the old plaster & lathe came out and it’s ready for ply now. We’ll match the ‘cove’ ceiling when the wall is replaced. 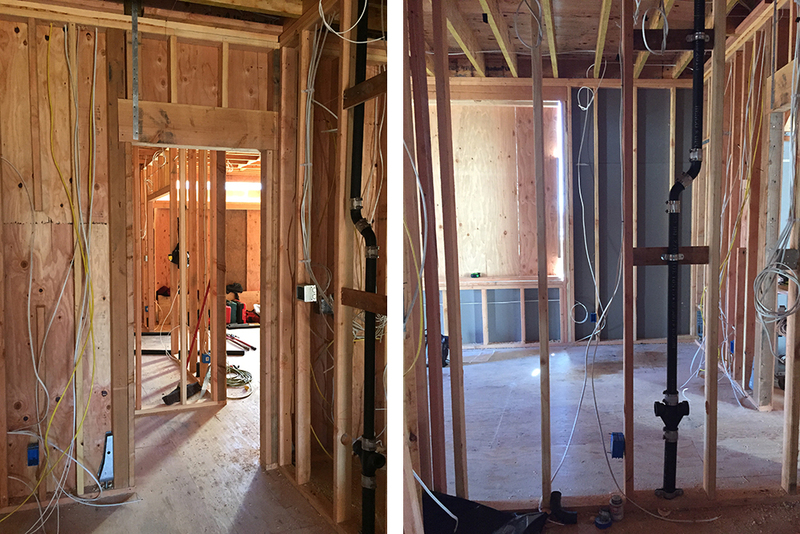 Walking through, the open walls are a jumble of new plumbing and wiring. 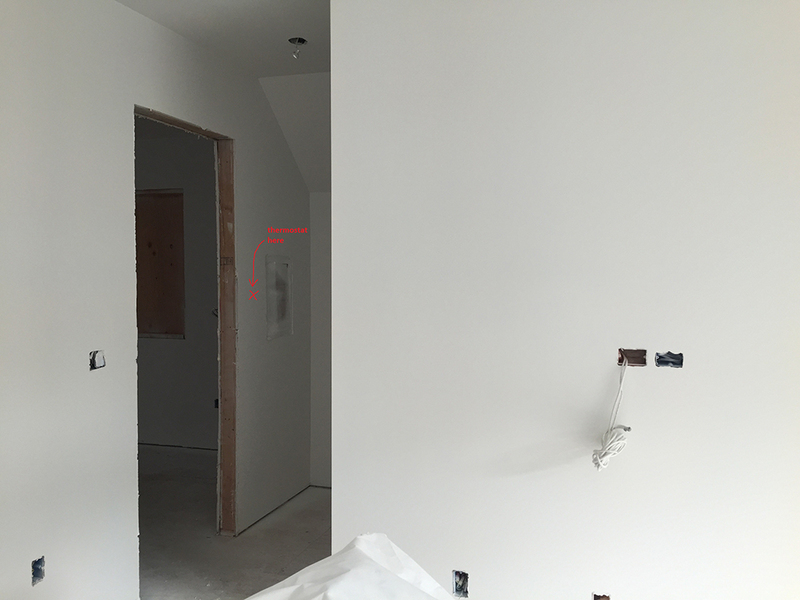 Locating switches, outlets, faucet heights, etc. and slight revisions and decisions while we have the chance. 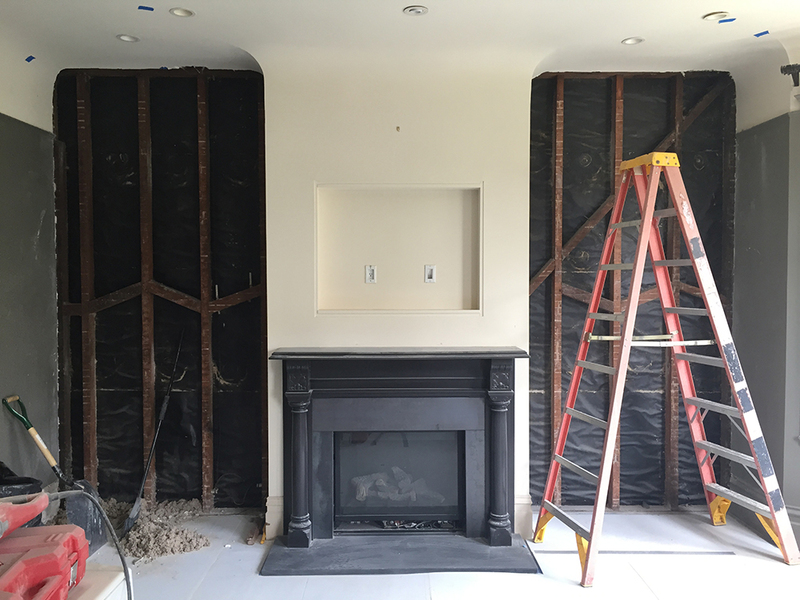 It all has to happen before the walls are enclosed with sheetrock. 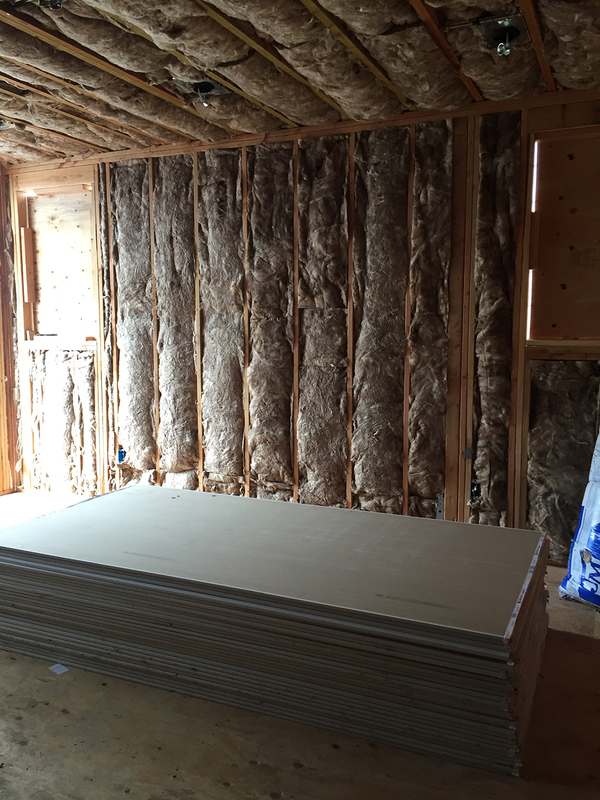 Insulation is installed. 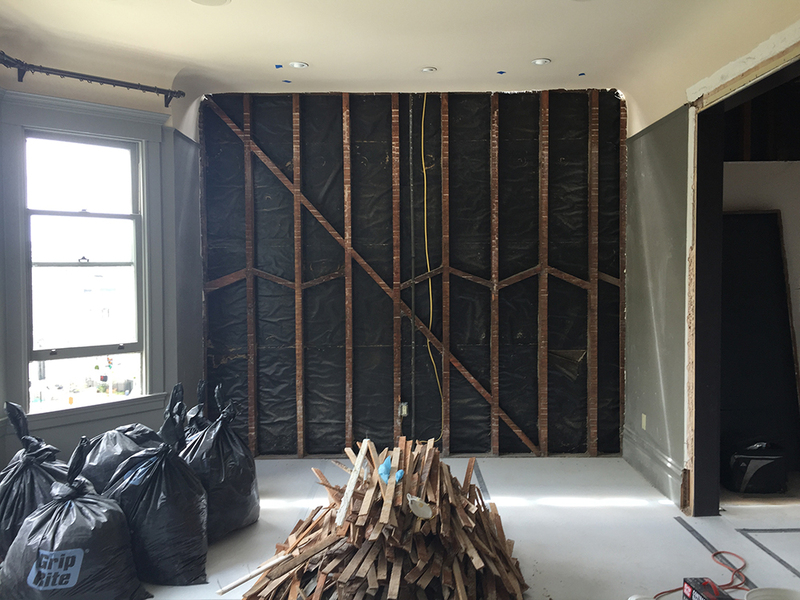 Sheetrock delivered and ready for install. 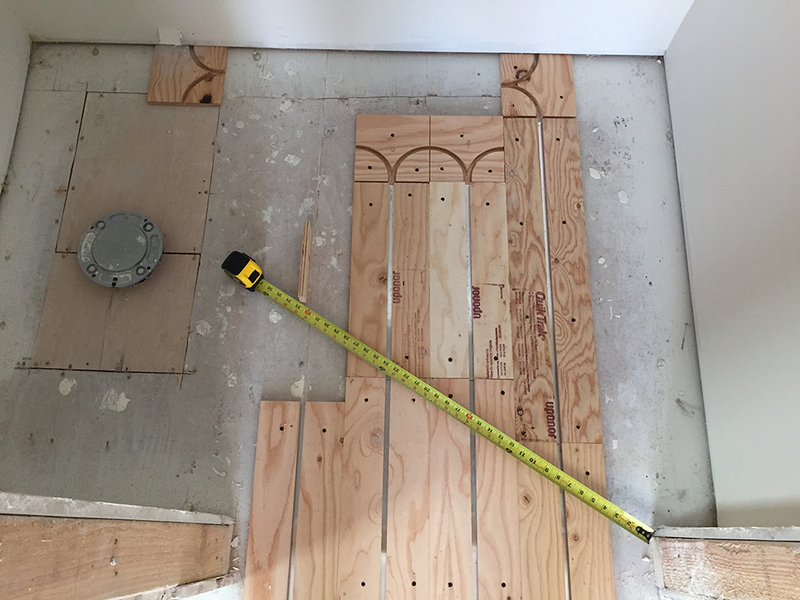 Above, the crew mocked up what the slope of the shower might be if we rise the core-required full 2″ from the low point of the infinity drain. 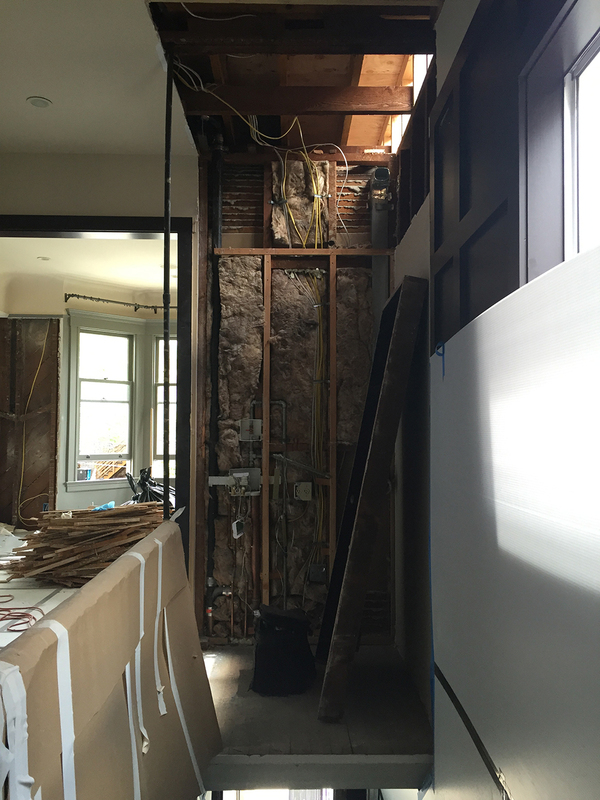 It seemed a bit steep to stand on sideways so we came up with the idea of dropping the infinity drain downward 1″ so the shower only has to slope 1″ down..
Just like that, the sheetrock is up! Windows have arrived are being installed right now as well. We’re using Sierra Pacific to match the windows we used on the floor below in 2009. Level 5 smooth….. and a note I made about a thermostat location. 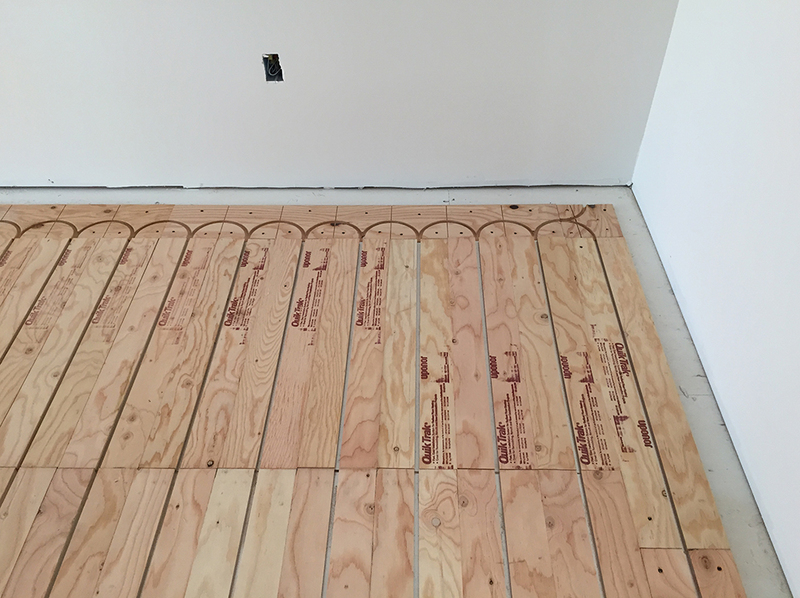 Radiant heating “Quik Trak” is being installed next, throughout the new floor level. A less costly alternative to Warmboards and others. In the old project we had to install the tubes from below because we did not want to reduce the ceiling height. A corner of the room with the pre-routed grid of the Quik Trak in place. Below, I had a little assistant on the site one day and asked her to take notes during my ‘meeting’, hence the pad & pencil. I could have gotten a better photo! 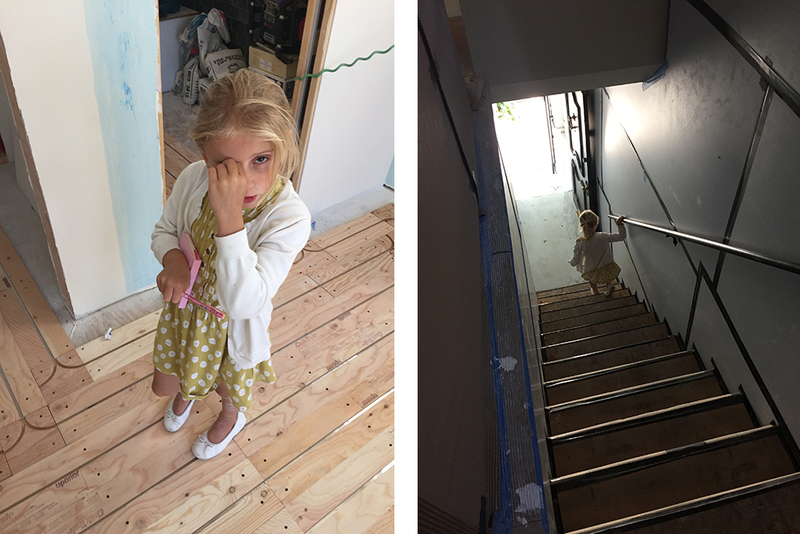 She enjoyed touring the construction site with Uncle Tom and then was down the stairs and ready to go home…but I can’t quit at 2pm!